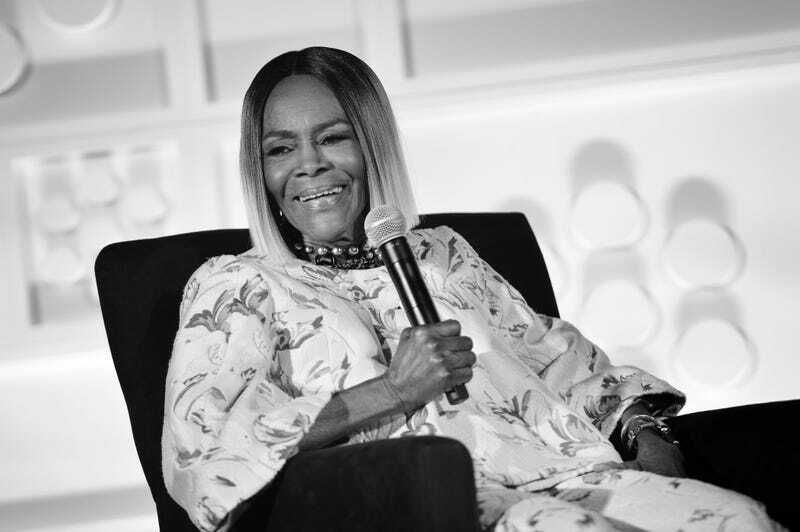 Cicely Tyson speaks onstage at the screening of ‘Sounder’ during the 2018 TCM Classic Film Festival on April 27, 2018 in Hollywood, California. At 93, Tyson has been chosen to receive an honorary Oscar this fall by the the Board of Governors of the Academy of Motion Picture Arts and Sciences. She’ll be the first black woman to ever receive such an honor, People Magazine reports. Though she’s only been nominated once for an Oscar (for the 1972 film Sounder), the legendary actress does have a Tony and two Emmys to her name, as well as a Presidential Medal of Freedom, awarded in 2016 by President Obama. And in April, her handprints and footprints were set in stone at Grauman’s Theater in Hollywood, Calif.
U.S. President Barack Obama awards the Presidential Medal of Freedom to Tony Award winning actress Cicely Tyson during a ceremony in the East Room of the White House November 22, 2016 in Washington, DC. But take away all the achievements and accolades, and Tyson would still be nothing short of legendary. The former model turned actress, whose onscreen career spans over 60 years and 90 onscreen acting credits (not to mention her extensive work on the stage), has always followed her heart when choosing roles; which include both mainstream productions, like Fried Green Tomatoes and House of Cards, and projects helmed by black directors and producers. Alongside Oscar-nominated works, Tyson has appeared in multiple Tyler Perry productions, and regularly stars alongside majority-black casts. Through it all, Tyson has fully committed to every role she’s taken on, been generous with the wisdom she’s accrued through the years—and is full of anecdotes that never disappoint. But she has also had a deep, far-reaching cultural impact—even inadvertently launching the first wave of the natural hair movement, as she recounted on Oprah’s Master Class. But the haircut was a hit—as were the cornrows Tyson subsequently adopted for her role in Sounder, becoming an instant icon of the Black Pride movement, simply because her love of her craft compelled her to always represent her characters as authentically as possible. It’s one of the things that makes Tyson such a phenomenal actress—and has consistently brought an innate dignity to roles others have considered denigrating. But perhaps that’s the particular fearlessness and ferocity of Cicely Tyson: Whether playing a maid or matriarch, a slave or a centenarian (notably, Ms. Tyson) played a woman older than she is now in 1974's The Autobiography of Miss Jane Pittman), she has never shied away from the honesty of the work. She’s also fully invested in the power of her own intuition; a skill most of us could likely benefit from. And while we can’t say for sure if what she calls “divine guidance” is been solely responsible for the incredible success and longevity of her career—or her seemingly divine presence—watching Tyson is still a wonder to behold. While we frankly can’t believe it’s taken the Academy so long to recognize Tyson’s incredible contributions to her craft, we couldn’t be more thrilled that one the world’s most beloved and respected actresses will be duly honored by the industry she’s so faithfully represented. To a true icon: We salute you, Cicely Tyson! View of Cicely Tyson’s hand and footprint at the Hand and Footprint Ceremony honoring Cicely Tyson during the 2018 TCM Classic Film Festival at TCL Chinese Theatre on April 27, 2018 in Hollywood, California. Updated, 9/14/18 at 7:45 a.m., EDT: At least one of our readers have pointed out that Oprah was honored with the Hersholt Humanitarian Award at the 2011 Academy Awards, for “humanitarian efforts [that] have brought credit to the industry, making her technically the first black woman to receive an honorary Oscar. Tyson’s Governors Award, which will be bestowed on November 18, is in tribute to her acting, making her the first to win that award.